Last Tuesday at J.P. Morgan’s headquarters in New York, I had the opportunity to join an amazing gathering of mostly women philanthropists for the Every Woman Every Child: Taking Action Summit, which was focused on the problems of the poorest mothers and children in the developing world. J.P. Morgan Asset Management CEO Mary Callahan Erdoes and her team had worked tirelessly for months to bring together more than 200 of the world’s top philanthropists and industry leaders. Yet among this group congregated in the financial capital of the world, the most engaging speaker was not a banker or an economist, but a beautiful woman from Africa. Toyin Saraki spoke in a mesmerizing whisper as she painfully recounted the emotional, psychological and physical devastation resulting from having her precious daughter die during childbirth. Would any Mother’s Day ever be happy with the memories of her daughter’s first day of life also being her last? The women seated in the audience were overwhelmed with emotion as they empathized with Toyin’s pain as if it were their own. They weren’t alone. I too felt great emotion. You may have guessed that Toyin is one of millions of poor women each year in Africa and India who lose their babies tragically during birth, or who die themselves in the midst of what is supposed to be the most miraculous event of a woman’s life. But you would be wrong. 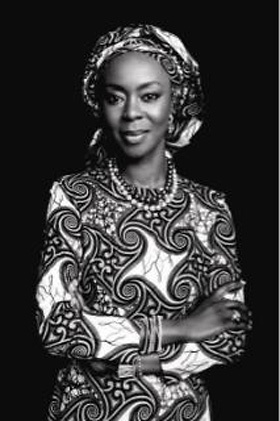 Toyin Saraki is an affluent, well-educated Nigerian who just recently stepped down as the First Lady of Nigeria’s Kwara State and is the founder and president of The Wellbeing Foundation. In an environment where there are not adequate medical facilities and qualified health personnel and equipment, the unthinkable loss of a child at birth can happen to anyone. Toyin has turned her pain and loss, as well as energy and knowledge, into raising awareness and resources so that all mothers and their children can celebrate every possible Mother’s Day in the future. Toyin recounted what drives her to work so tirelessly on behalf of mothers in Nigeria and beyond. “On December 6, 1991, I got married, gave birth three months prematurely, had twins and lost a child, all in the space of 24 hours,” she told us. During this harrowing period, I experienced that which was never intended for me, but which is an unavoidable reality for the majority of the women in my country: the inadequacies of the Nigerian Health System. In 2003, a friend with whom I worked — a woman named Chinwe, the wife of the then Commissioner for Health — was pregnant and went into labor while visiting family members some distance from home. She was taken to the nearest hospital. She needed a Caesarean, but died while waiting for the key to be found for the operating theatre, which a nurse had diligently cleaned and locked up. Why could this not have been anticipated? Because Chinwe had no health records to present at the hospital, which would have revealed that her baby was in a transverse lie, and could not be turned. The Caesarean denied her in life was performed on her dead body to no avail. The baby died, too. And this was the wife of the Health Commissioner and had access to a hospital! I just couldn’t stand seeing any more needless deaths of women and their babies. So I decided to devote my life and public offices to be with mothers in rural health centers. I’ve seen children die, because parents can’t pay registration fees, because of a lack of medical records, and because basic medical equipment and drugs are lacking — all preventable and senseless reasons for death in and around birth. We must educate women about prenatal programs, proper nutrition during pregnancy, the need to have a supervised birth in a clinic or hospital, the need for proper medication to be available at birth to prevent preeclampsia and hemorrhaging, and to exclusively breast feed for the first six months of the baby’s life. I am so grateful to J.P. Morgan and all of the participants at last week’s conference. I hope we become partners with all of those philanthropists and help mothers in Africa and elsewhere learn all that can be done to save their and their children’s lives. We can’t let 4.4 million children under the age of five die in the next 958 days. It is overwhelmingly sad to realize that one quarter of all the world’s maternal deaths occur in Nigeria — that amounts to over 60,000 women per year. In addition, almost 800,000 Nigerian children die before the age of five each year. Mary Callahan Erdoes and I were so moved by Toyin’s words that we asked the philanthropists present to think about coming together as a “family” or a “partnership” to work with communications professionals as we launch an unprecedented media and education campaign. The goal: Making every man and woman contemplating having a child aware of all the steps that have to be taken to optimize the survival of the mama and her baby. Over the next several days, the emotions from Toyin’s candid talk stayed with me. What more could I do? Are we responsible for what happens to strangers on the other side of the world? Don’t we have to worry about our own families and the people in our communities instead of foreign children? I quickly came to the conclusions that to be truly satisfied and happy, each one of us has to help anyone we possibly can — irrespective of where they are and what they believe. Helping our friends and our family members does not preclude helping women and babies in Africa or victims of the Tsunami in Indonesia or the earthquake in Haiti. We would walk through fire to help our own children and those in our communities, but why stop there? I am very thankful to Mary and her team at J.P. Morgan for bringing together an eclectic mix of clients, industry leaders and global philanthropists to be connected to the plight of the least fortunate mothers and babies and collectively brainstorm how we can help going forward.